Blind Justice: In Tory-led Britain, it’s also deaf. And ignorant. In fact, can it really be described as ‘justice’ at all? A story has appeared on the BBC News website, stating that elite barristers have joined the chorus of opposition to the government’s plan to cut legal aid for criminal cases by almost a quarter. 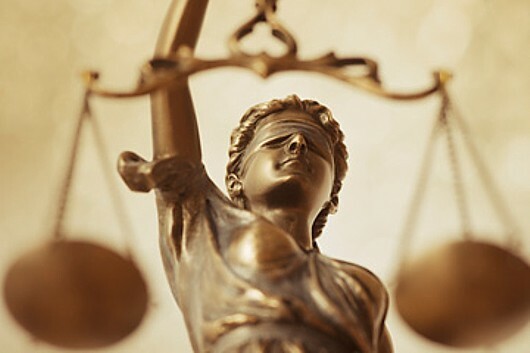 It states that the Treasury Counsel, a group appointed by the Attorney General to prosecute the most serious crimes, has followed the lead of the Bar Council and the Law Society in saying the plan to cut £220 million from the annual £1 billion legal aid budget is unsustainable. This is accurate, but fails to address the most damning indictment against Chris Grayling and the Ministry of Justice in this matter. This means that Chris Grayling and his cronies have decided to ignore evidence-based opposition to their plans because of an unfounded, unquantifiable “belief” that cutting funding will not affect the quality of the legal advice available in criminal cases. If this matter were itself a court case, it could be settled with a simple question: When has this ever been proved in the past? Can you think of any time when cutting budgets has not harmed a service – or actually improved it? Of course not. The response – written by people who are appointed by the Coalition Government’s own Attorney General, let’s not forget, and who may therefore be taken as broadly sympathetic to its aims, continues: “The Minister of State said, ‘This is a comprehensive package of reform, based on extensive consultation. I believe it offers value for the taxpayer, stability for the professions, and access to justice for all’… yet the Impact Assessment attached to the new Paper simply makes no attempt to evaluate or monetise the behavioural changes that will most certainly result from its proposals. “The entirely obvious and predictable outcomes are lost quality and reduced supply. These are airbrushed in the Impact Assessment by repeated “steady state” assumptions. The behavioural changes are not then, uncertain. Neither will any steady state remain. They are, though, unpalatable; they will not improve the public interest. The assessment of the Treasury Counsel is that cumulative changes since 1997, and a real terms cut of nearly half since 2007, mean Grayling’s proposals “will do significant harm to the operation of the criminal justice system… In particular, they will have both an adverse and disproportionate effect on the supply of such services by the acknowledged experts – the criminal Bar”. In other words, allowing the market into the Criminal Justice Service (that’s the ‘CJS’ in the quotation) has lowered its quality and increased its cost. The bottom line: “We consider that the proposed reductions, in whichever iteration, are unnecessary, have an effect much larger than claimed and will produce unsustainable results.” In terms of quality of service, it seems that it is the government’s proposals that are unaffordable. 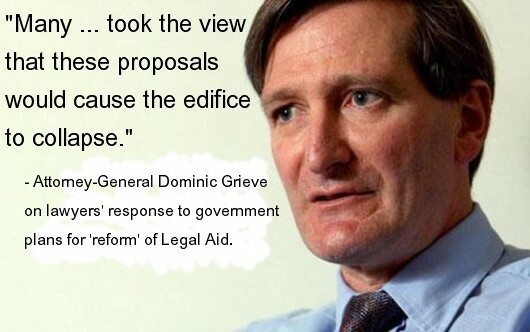 The Attorney General himself, Dominic Grieve, indicated his own lack of enthusiasm for the proposals in a letter to the Bar Council in June. This accepted that opposition to the proposals cannot be explained away by self-interest, acknowledging that there is serious and principled opposition to the proposals which cannot be attributed to mere selfishness. “Many… took the view that these proposals would cause the edifice to collapse,” he wrote, adding that he would continue to draw Grayling’s attention to the concerns that had been expressed to him. It seems, considering the latest developments, that the Ministry of Justice not only has a bad eye but also a deaf ear. What a shame its members are not speechless as well. For the sake of balance, here’s what a Ministry spokesperson had to say: “At around £2 billion a year we have one of the most expensive legal aid systems in the world and even after our changes would still have one of the most generous. We agree legal aid is a vital part of our justice system and that’s why we have to find efficiencies to ensure it remains sustainable and available to those most in need of a lawyer. Is it constructive for a government department to ignore evidence that it has specifically requested? Is it consistent to run a consultation process, and then throw away the results because they don’t agree with ministers’ “belief”? Grayling’s plans are ideologically-based and entirely unsupportable and should be laughed out of court.